Puddles of Myself: The Marriage of Federer and Nadal: Who's the GOAT? The Marriage of Federer and Nadal: Who's the GOAT? On Sunday, Rafael Nadal won his 6th French Open title. The win gave him his 10th Grand Slam championship. In winning the match he raised his overall record against Roger Federer to 17 and 8. The fact that Rafael Nadal “owns” Roger Federer has suddenly changed from some kind of heat of the moment boast to something more closely resembling fact. In the course of the 2011 French Open, the narrative for Roger Federer changed from the fact that he might be washed up to a rumble that he looked in top form to, “He’s back! Good God look at that serve, he’s back!”—the last comment coming after his epic victory over Djokovic in the semifinals. Now, after a loss to Nadal on Nadal’s preferred surface, Federer finds his story in a strange place: he is suddenly and unceremoniously being removed from his thrown as the Greatest of All Time. Why is he being removed? Because he has been able to consistently beat everyone besides Rafael Nadal. Now, Djokovic too has a winning record over Federer, but this is seen as some latter day changing of the guard in the story of Roger Federer’s tennis career. Djokovic is now the upstart whose head is finally on straight—and enigmatic roadblock to Nadal’s ascension as the Greatest of All Time. Djokovic is a fine player, but Nadal has beaten Federer in Federer’s prime. First it was only on clay. Then, he took him to the limit at Wimbledon in 2007 before finally beating Federer the next year in perhaps the greatest tennis match of all time. Nadal and Federer are tied together by time and history and, unfortunately, there is nothing we can do about it for better and for worse. As this article points out, how can we consider Roger Federer the Greatest of All Time if he has not been able to consistently beat his greatest challenger? Nadals 17-8 record against Federer suggests less of a rivalry and more of one player dominating another—Nadal’s rugged strength and defense mastering Federer’s elegance and seeming magic. As Wiedeman points out, Michael Jordan never had one opponent he could not consistently beat. Michael beat everyone, even those initial bullies like the Detroit Pistons who stood in the way of his dominance. Do 16 Grand Slam titles truly matter, do they mean anything if you can’t beat your greatest competition? It’s an interesting question and I say that the 16 titles do matter. I don’t particularly like Federer despite all of his well-known grace, good sportsmanship and class. Federer makes the game look easy and beautiful, but there always seems to be something forced behind it all, something I can’t quite articulate, but to me is painfully evident. However, he is a fantastic champion and quite frankly dominated the sport of tennis for nearly a decade. He has the most Grand Slam Championships of all time and that kind of success has to mean something. Even if the competition of the field was inferior in the heart of his dominance, tennis is set up so that even an inferior field can breed an upset over an overwhelming powerhouse of a champion. Nadal is my favorite tennis player of all time, but Federer is the greatest player of all time. As much as I love sports and love comparing different players and eras, I know that the exercise of comparison is wrong. 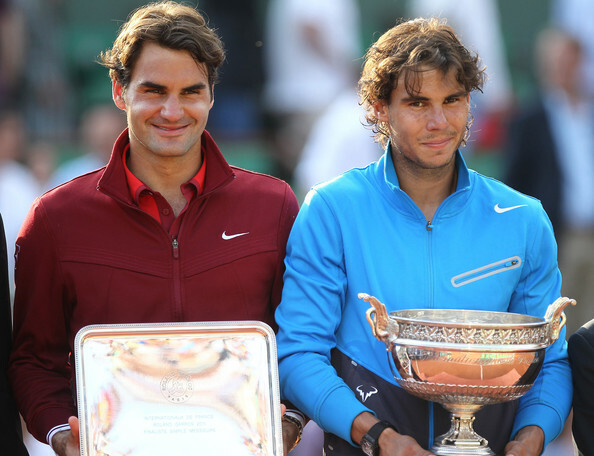 Even though Nadal and Federer are peers in a sense, there is a certain distance between them. Federer is close to five years older than Nadal, which is equal to ten years in tennis. They do almost represent two different “eras.” But their greatness and their rivalry and their combined shadow over the field causes us to compare. It’s hard not to since they have been magnetically drawn to each other in their stature, which is directly due to both their achievement as well as time. I was reading Jeff McGregor’s piece on Nadal and Federer and he suggests that Nadal is slowly becoming Federer, that his game is evolving beyond its initial reliance on strength and ungodly endurance. McGregor says that Nadal has become a much better shot maker and technician, closer to Federer’s mold. I don’t know enough about tennis to know if this is true or not. Nadal never exudes the elegance of Federer on the court and he’ll never leave you speechless with his array of trick shots. However, Nadal has improved his serve so that he breaks it out when he absolutely has to. To my eye, he no longer presses with as much force during a match so that you wonder if his knees will explode. He still has that reputation, but it is no longer his actual identity. His actual identity as a tennis player is the best defensive player of his era and perhaps the most accomplished shot-maker, even better than Federer. He doesn’t have the same magic tricks, but a ball you thought was dead will suddenly coming back to you at the strangest angle. Nadal doesn’t dress it up—he just does it. And, because he cares so much, because he plays so hard, you never know when he might unveil a new trick, a new element to his game. That new element will most likely be something as simple as his shocking service game at the 2010 U.S. Open. The description of his game sounds like some strange combination of Nadal and Federer. 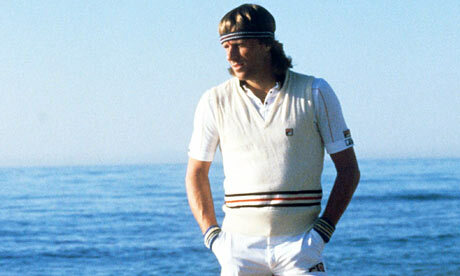 And maybe that means something, but what I was mainly struck by was the field that Borg played against. He won titles against Ashe, Connors, McEnroe, Vitas Gerulaitis and even Rod Laver. When reading about Borg, there was an overwhelming sense of history that rose from the era he played in. I’m not trying to say that the historic field makes Borg a better champion than Federer or Nadal, nordoes the fact that he has such an iconic stature within the game—its just who he is, its just what Bjorn Borg means. He is the mythic figure with silver locks who sits courtside at all the Grand Slams. He is the enigma. He is something that “tennis,” the very definition of the sport as something done in history, needed to exist. Nadal and Federer have made me love tennis. It is a sport whose psychology is perhaps not matched elsewhere. Not even my beloved basketball has no many ebbs and flows in momentum and psyche that can seemingly happen in an instant. It is one man against another man, each one relying on his endurance, body control, confidence and acquired skill. It represents all of the individual traits and philosophies I admire in life: independence, self-reliance, competition and success. Where sometimes I find myself facilitating others, perhaps to both their detriment and mine, tennis has no facilitations, only individual reliance and achievement. Nadal and Federer made me realize this. No, Nadal is not becoming Federer, but they are tied together by something that may look like a fusion or transformation. Obviously, their rivalry ties them together. As a sports pundit, Mike Greenberg, said, Federer and Nadal are writing the history of tennis right now. When we talk about tennis we will talk about Nadal and Federer. Perhaps it is their difference in style or the fact that the stakes are so high whenever they play; or perhaps it is merely the fact that Federer vs. Nadal is all we truly want to see. But maybe it is something else. Nadal and Federer need each other and the sport of tennis has needed them both. I don’t believe you would have an ambitious but mentally fragile Andy Murray, a quirky but dangerous Soderling, an always game Del Potro, Ferrer or Monfils, and even a motivated Djokovic if Federer alone was running roughshod over the sport. It is their combined dominance that inspires others. Two men existing and battling in a rare air is far more encouraging than just one man battling himself (Jordan may have been the lone exception to this rule). Nadal and Federer are tied together by something more than a rivalry, they are bound by some kind of mysterious fate, their actions, their victories and failures that are history. And when those things are involved, which one of them is the greatest of all time doesn’t really matter—even if I’ll always be rooting for Nadal. Roger Federer is almost 30 years old. The fact that you idiots are even questioning his goat status because he lost to a just turned 25 year old is ridiculous. Please reevaluate your thoughts. I totally agree with you. Maybe the post didn't fully express that. I was mainly worried by the overall inclination we have to argue and declare who the GOAT is, when really it doesn't matter who the GOAT is. It just matters that Federer and Nadal are fantastic togther.